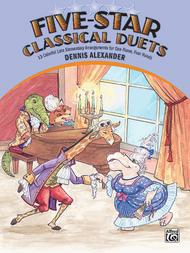 Five-Star Classical Duets arranged by Dennis Alexander. For Piano. Duet or Duo; Masterworks; Piano Duet (1 Piano, 4 Hands). Masterwork Arrangement. Late Elementary. Book. 32 pages. Published by Alfred Music (AP.21347).ISBN 0739029835. Masterwork Arrangement.Students will have fun exploring classical operatic, orchestral and piano music through these duets. Arrangements of works by Bach, Mozart, Beethoven, Verdi, Liszt and more are included. Both primo and secondo feature the melody and are equally difficult. Reading is facilitated by both parts being on the grand staff.